I think something must be slipping... I forgot all about doing a blog post yesterday. I woke up in the middle of the night realizing I hadn't done one. I was just going to show you where I swim, so I'll do that today. This was only the third day I've swum this summer, but today I went farther than I thought I'd be able to do so soon. I'm not fast, and my technique isn't fantastic, but I get there. The lake has a nice small beach. Most days there are quite a few families there, with kids in the water, but yesterday it was deserted. Fine with me... that way I don't have to watch out for boats. I also made a big tub of cole slaw for my dinners this week. 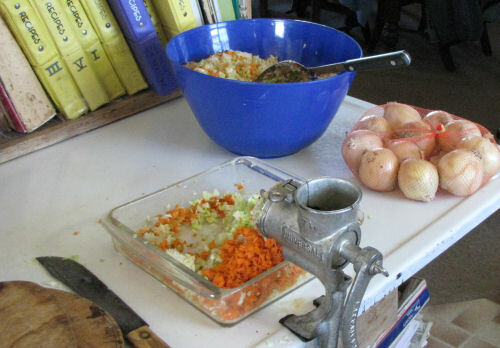 I always used to hand slice the cabbage and grate the carrots, but I recently discovered that I like the texture when it's coarsely ground with my Universal Grinder. Not a strenuous day. That's fine. Next week is going to be nuts. Nasty hot muggy day. I know most of you in the US are having the same thing, so I don't expect sympathy. I just don't do humidity very well. 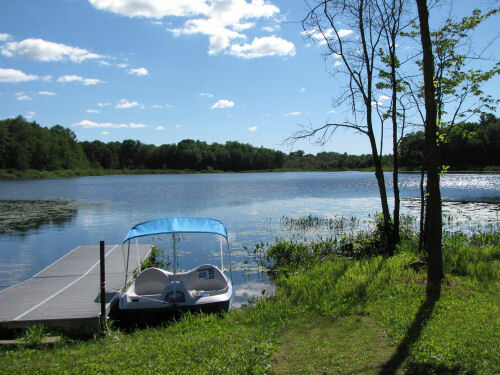 But it was hot enough to get me over to Hackert Lake for a swim. I'm SO out of shape! But the water felt good, and I'll work on building up the stamina. Here's a picture of a catbird I took a couple of days ago. They usually hide in the bushes, so I feel really lucky to catch a picture. They can be good mimics, but usually they just make a noise like a mewing cat. When I first saw it, it was actually standing in the parking lot. 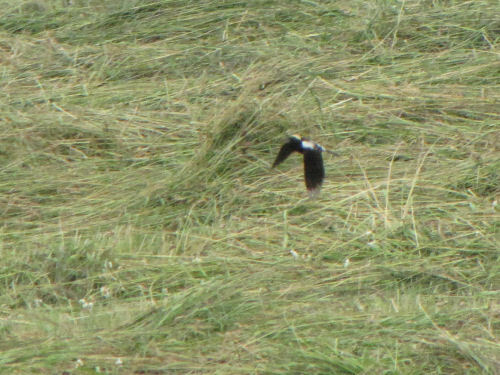 I knew instantly what it was because they often hold their tails cocked upward at a jaunty angle like a huge wren. It's a really odd posture for a large-ish (robin sized) bird. Tomorrow... resort cleaning day again. Can you find the directions of the compass with only the sun to guide you? Did you know that midsummer, it's a little bit different from the other seasons? I used the sledgehammer as a gnomon. (Isn't that a great word? It's the upright of a sundial). The reason this isn't a sundial is that I'm not trying to tell the time. In fact, I used the clock to note when to take the pictures- one every hour all day when the sun was high enough above the trees to make a shadow. Then, I created a composite. You can click it to make it bigger. I recommend you do so. Now, for the interpretation. The yellow line is the actual east-west line (pretty close- this isn't a technical drawing). The first thing you should notice is that the shadow cast at 2 pm is the closest to pointing straight north. What's up with that? That's the easy answer. First of all, we are in Daylight Savings Time, which pushes the clock time of 1 pm to be most like noon sun time. But there's another thing going on that makes the shadow almost an hour off where I live. I'm in western Michigan, but I'm still in the Eastern Time Zone. In fact, I'm almost as far west as you can be and still be in Eastern Time. There are parts of the Upper Peninsula that are farther west and still in Eastern Time. So, the effect of that is to make the 2 pm clock time the closest to noon sun time. Got all that? So what? So, if you are where I live and want to find north by your shadow, you have to make mental adjustments, or wait till almost 2 pm to see that north-pointing shadow. Now for the other goofy thing! In the northern hemisphere, the sun is generally in the southern sky. That's why a shadow is cast at noon sun time. For most of the year, in the early morning your shadow will point slightly northwest, and in the late afternoon your shadow will point slightly northeast. So, to find true west or east, you just adjust a little bit. At the equator, your shadow at noon should just be a spot around your feet equal to the largest diameter on your body. However, at the summer solstice, the sun is at its farthest point to the north. This is extreme enough to overcome that generally southern track. Note on the picture that the shadows at 8 and 9 am, and 7 and 8 pm are all beyond the E-W plane. So, at this time of year, if you are walking directly into the sun in the evening, west is just slightly to your left. For most of the year, west would be slightly to your right. OK, I'll stop now. If you are like my friend Marie, she is good with all this up until the part where I add any information beyond "the sun is in the sky." Well, I'm kidding. She knows it comes up in the east and sets in the west. What can I say? She's glad I can find my way with the sun! There were any number of things I should have done this afternoon. Did I do any of them? Nope. This is the one day yet this week when the temperature was going to be tolerable for anything other than sitting in front of a fan. So I figured I'd put off the "desk" work, and go for a bike ride today. I chose a 12-mile road loop with about 7 of them on dirt. I knew it was all at least moderately shady, and only one of the paved roads was straight. 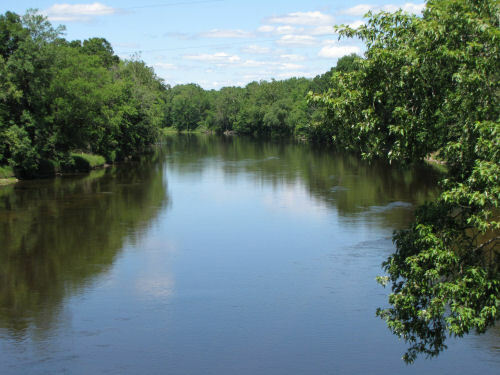 The route started right out with a crossing of the South Branch of the Pere Marquette River. To make the loop work, I had to follow Wilson Road east and then find the main two-track southeast, which would be Aspen. I had no delusions that it would be marked, but hoped I could figure it out, and I did. The sand was very loose on Aspen, and the riding was difficult. In fact, I had to walk the bike a few places. Maybe someone stronger could have kept riding, but I can't keep the speed up enough in the deep sand. Aspen seemed to go on forever, and I thought maybe I had gotten on some other road, but eventually I did come out on Walhalla Road (where I knew Aspen had a sign), and it was that road. Walhalla is the straight paved road, but even it had moderate shade. 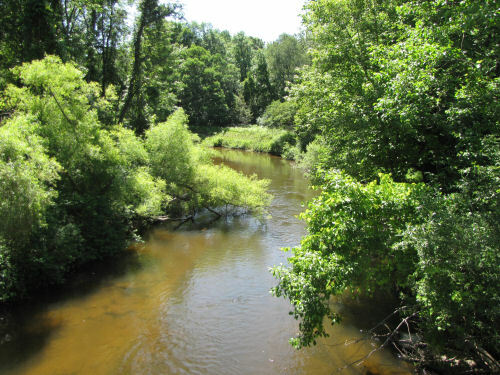 Soon I reached the southern end of my loop with another crossing of the river. Soon after that, I turned east on Hawley, also paved, but with nice curves. 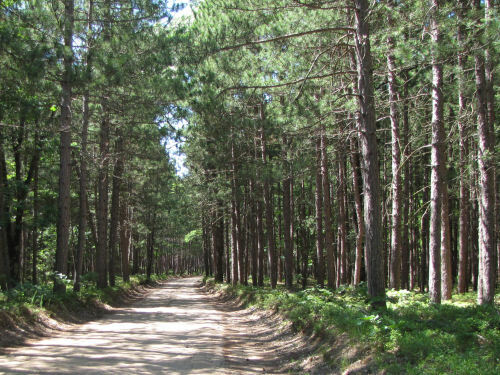 Another 2.5 miles, and I turned north on a dirt road called Indian Trail. It had a much better surface than Aspen, at least at the south end. 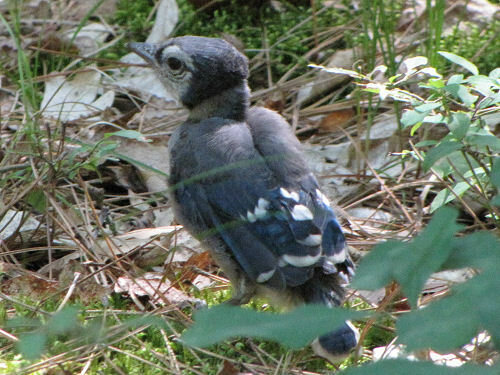 Along this route I watched a fledgling blue jay testing his wings. Mom was having a fit from a nearby tree, but the little one didn't care much about me at all. He fluttered along the ground a bit, finally managing to get up on a log. After a long rest there he took off and crashed head first into another tree. No worries, he wasn't going fast enough to get hurt. I left him to his lessons. The final mile of the ride had loose sand again, so I had to walk a short section. I arrived back at my car in two hours. It was a great ride. I would call it moderately hard, because of the loose sand. Not sure I'd do it again for the same reason. I'll probably look for another interesting loop. Tomorrow, I have to buckle down. A very busy day, but I had one work assignment in the afternoon with a long drive, so I just enjoyed it! 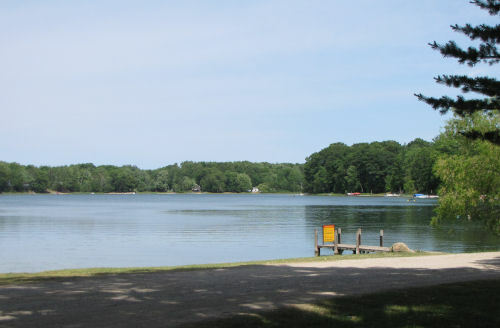 And here's Black Lake in Oceana County. This is not the same Black Lake as the one where Ellen and I nearly froze but were determined to have a "picnic." Nothing complicated to share today. I was going to say nothing profound, but that's not true. Warm breezes, blue sky and water, a couple of hours of wandering less-traveled roads, and I am happy. 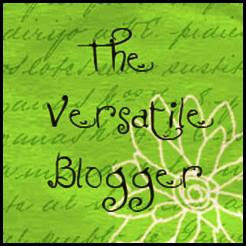 That's what this blog is all about. And that is profound. Om and I thought about doing this yesterday, but actually got around to it today. Someone sent me an email this week, telling me the Hart-Montague Rail Trail was paved for an additional 8 miles farther south than I thought. So I wanted to check it out. It really is paved that much farther. Apparently it has its own name, the Berry Junction Trail. 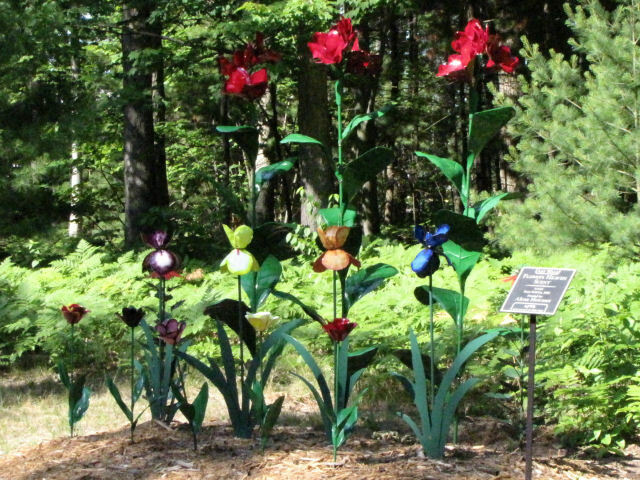 Whitehall has been creating a beautiful trail space with gardens, and an Art Walk. One of the new constructions was added last year, with this new piece of trail. It's called "Flowers Heaven Scent," and is made of metal. 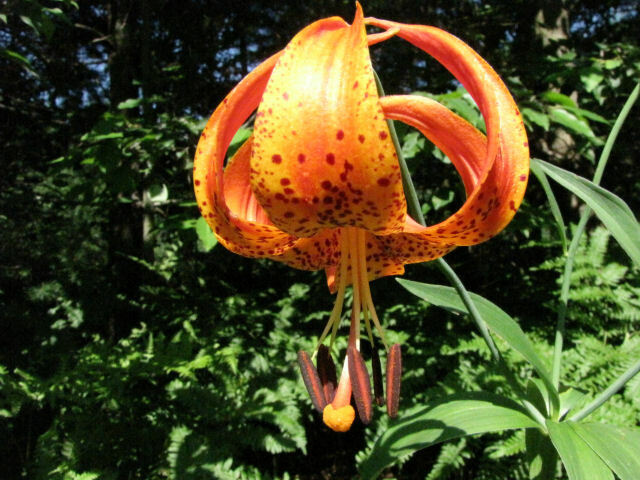 Also of interest is this real flower, the Michigan Lily. Really, it's Lilium michiganense. It's similar to Turk's Cap Lily, but has more clear orange. Om was more interested in this. 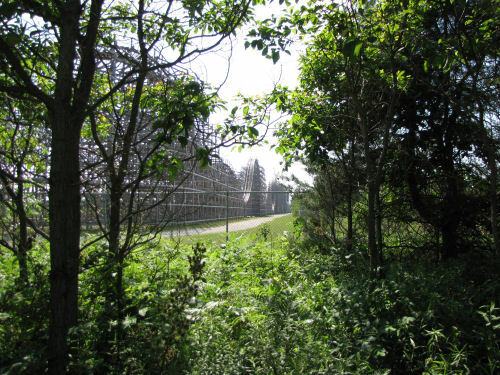 The trail goes right beside Michigan Adventure, a smallish amusement park. But they do have a decent wood roller coaster. It's called Shivering Timbers. We were about two miles from the end of the ride, and saw ahead of us a guy sitting on the pavement, talking with a biker. We got closer, and realized we knew the guy on the ground! It was our buddy, Josh Schuyler. He had broken a wheel on his inline skate, and had to borrow an allen wrench from a biker to take it off. What fun! He skated the rest of the way back with us. 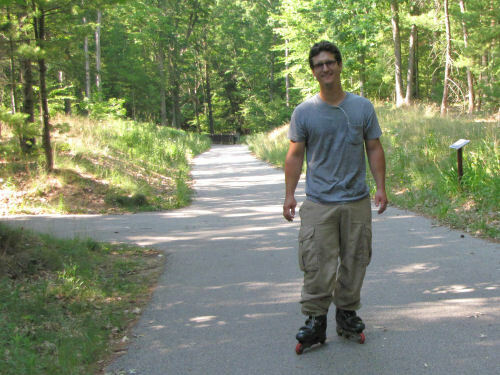 He's a great skier, and uses the roller-blading as a way to stay in shape for that. Only about 16 miles, but it was a lot of fun, and now I know about the trail extension. 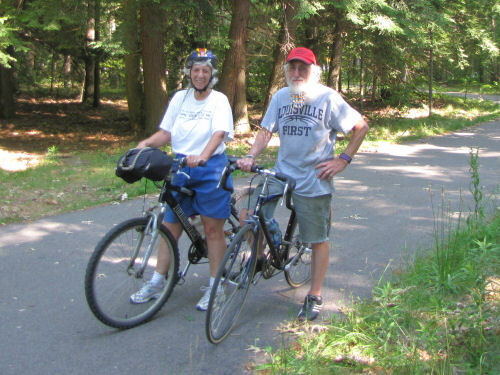 It just ends at a road crossing, but the ultimate goal is to connect with other trails that go to Grand Rapids, or Holland. Here's another leftover from the New York trip. 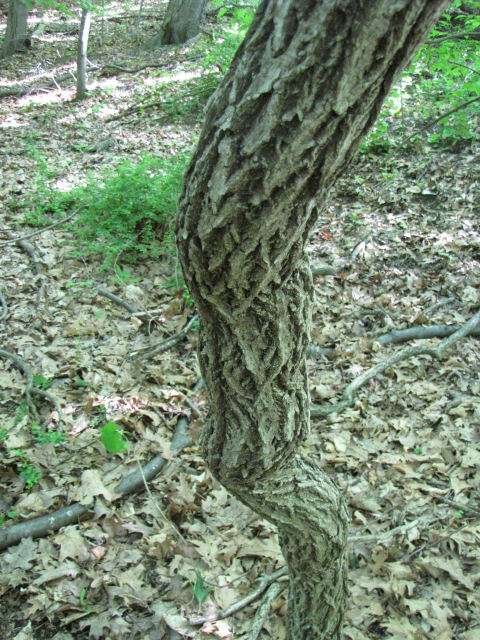 Marie wanted to show me some fantastic vines she had found. They were curling all over the woods, and each other. When the vines got large, the bark broke into clear diamond shapes. I had no idea what it was. I kept trying to find some leaves that actually went with the vines. I finally found some way up high. The camera helped me pull them closer. They weren't any help. 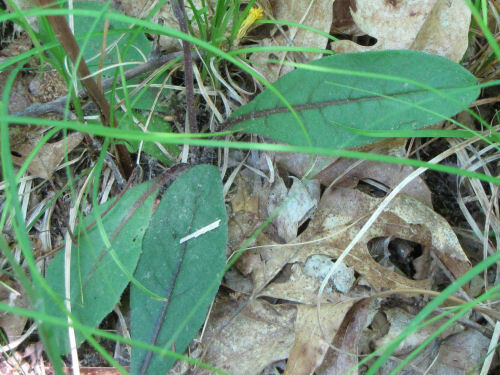 With a bit more hunting we found some leaves closer, and discovered that the plant was actually in bloom. Here are the little green flowers. I was totally mystified. I didn't even know where to start looking! 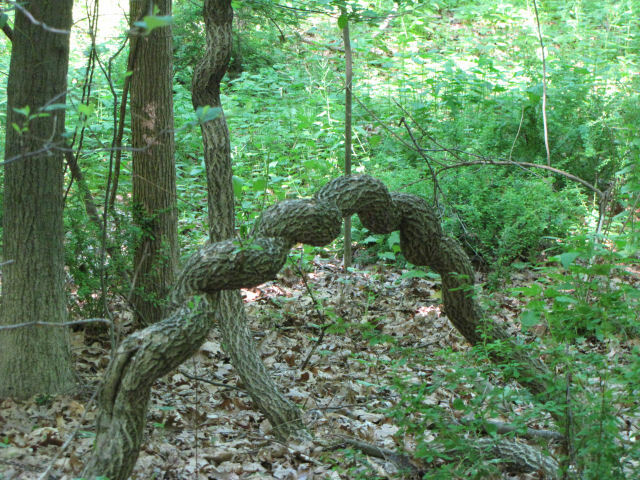 Thanks to the internet, searching for large curling vines soon led me to the answer. This is an alien bittersweet, Celastrus orbiculatus. Sometimes it's called Oriental or Asian bittersweet. In the fall, it will have the orange fruits familiar on the native bittersweet. 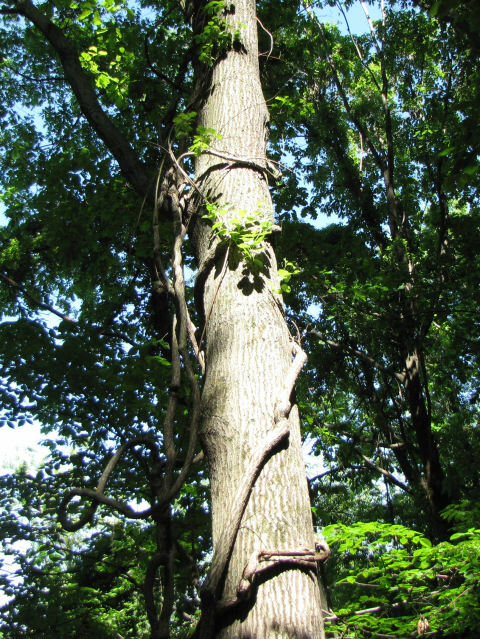 But the problem is, it will grow all over anything, even large trees, and strangle them all. Bet I won't forget this one! Another award! I had a long run without any. Not that I'm complaining; not at all. I've received quite a few over time. It's fun to pass them around, but some people don't like to play. That's fine; some people have more serious blogs, or don't have time to get their heads around the requirements. Anyway, I'm supposed to share seven things about myself. The bottom line is that it wasn't that bad. However, I have to say it felt a little bit like a bad joke about hell. As eternal punishment for not cleaning my own kitchen, I am doomed to clean an endless succession of kitchens forever. Now, I have to give the award away. First goes to my buddy John Bain, at Don't Unplug Your Hub. He's an artist through and through. Wish I could paint or make music that well. Next, I'll hit John Sealander at Some Assembly Required. He's a total dalmatian lover, and we have a lot in common. How about Jim, Dennis' dada? I just have to love those goofy Vizslas at Dennis' Diary of Destruction. Did you know he's an author too? I recently read A Flock of Crows is Called a Murder. I'm not a fan of paranormal books, but it's just enough to be creepy without being ridiculous. A good read. He doesn't have the kind of blog that will probably accommodate awards, but I'd like you to take a peek at my friend Ken Brown's blog. He authors the You Can Learn Series. He recently interviewed me about my writing, but that's not the point. Ken was the founder of Adgitize, when it was still a viable blog advertising system. He is a talented businessman with many interests. Here's another artist- Rose at What I Made Today. Everything she touches turns into art. I'm really jealous! OK... I think I'm done. As is so often the case, an alien plant is such a beauty! 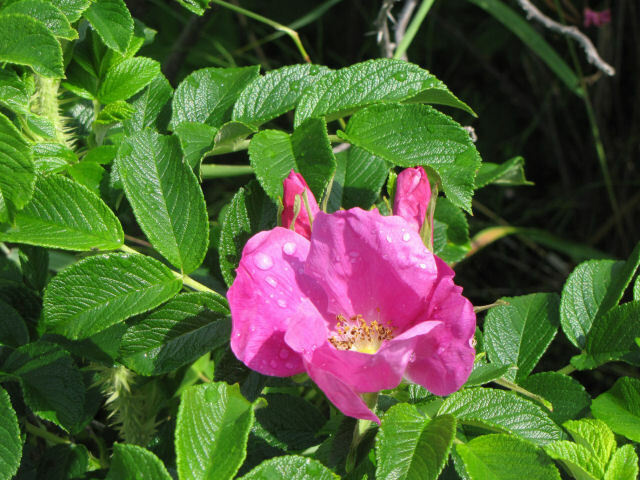 This is Wrinkled Rose, Rosa rugosa. It gets its name because the leaves are rough (rugose) and crowded, making them look wrinkled. 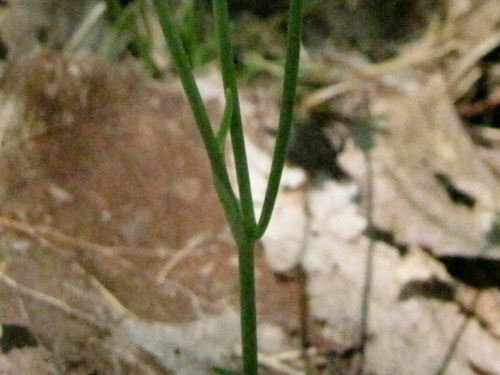 It also has very bristly stems. This is absolutely diagnostic, unless the thorns are purple. 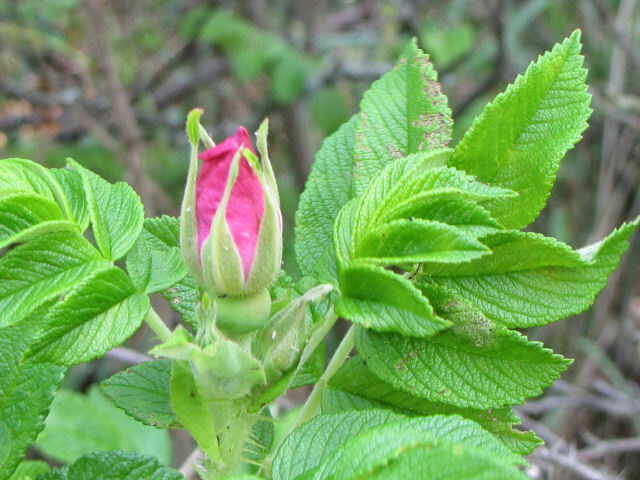 The buds are lovely, because the flowers tend to be rather large, and a deeper pink than many of the native wild roses. 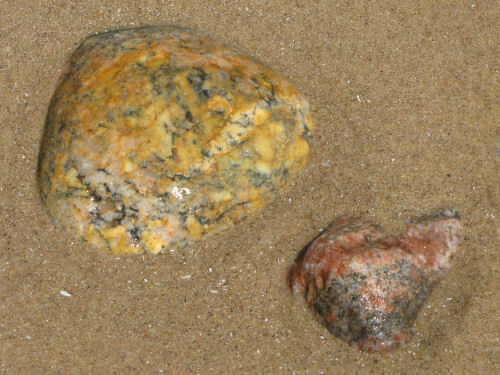 They like to grow in sand, so you're likely to see them fairly often, here in Michigan! 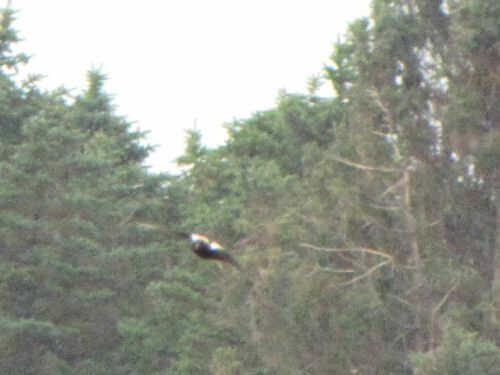 Actually, the most interesting thing I saw today was a Woodcock flying, but I couldn't get a picture. They look like some strange, huge insect more than they look like a bird. Their beak is too long, they have "no" tail, and they take off as if they are standing up, so they look a bit like a hovering hummingbird, but they are 10-12 inches long. Wish I could have gotten that! 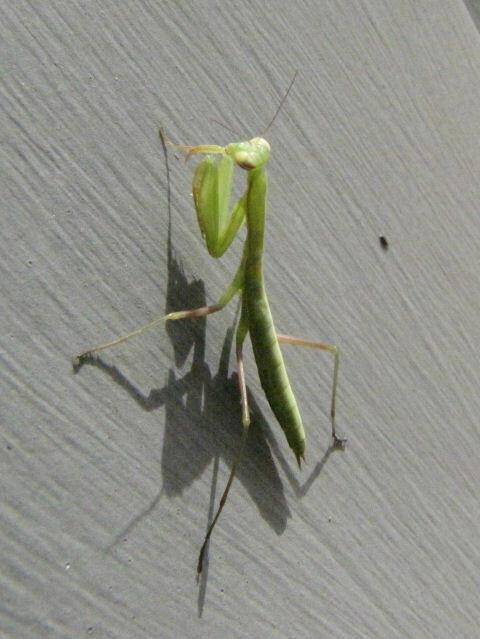 I'd been watching a praying mantis egg case on my kitchen steps all winter. A few days ago it disappeared, but I hadn't seen any babies. The babies are about 1/2 inch across. I showed a rather bad picture of one at A Diversity of Wildlife. Apparently I missed that stage of these babies, but today I found a teenager on my kitchen door. Just one. Maybe he/she ate all the siblings. Yes, they do that. But I hope more of them lived. 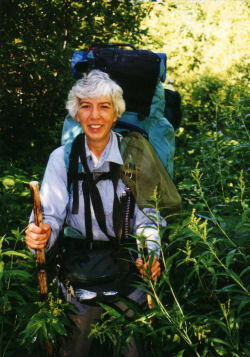 They go through several nymph stages before they gain their wings as adults. No wings on this one yet, I think. The body is only just over an inch long. It was so hot and humid today, I had to go somewhere cooler and wet. I wanted Maggie to be able to go, which really limited the choices. 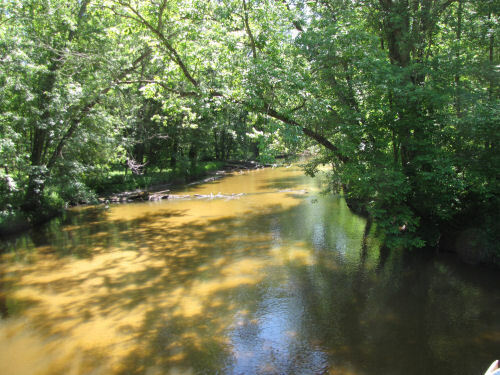 But Summit Township Park allows dogs on leash. And there is access to a lot of unpopulated beach north of there. We walked around the point you can see here, and a bit farther before turning around. I walked in the water. The big lake is warm (water temps in 60's) already- it's only June! Maggie is so prissy. She hardly ever let her feet get wet. 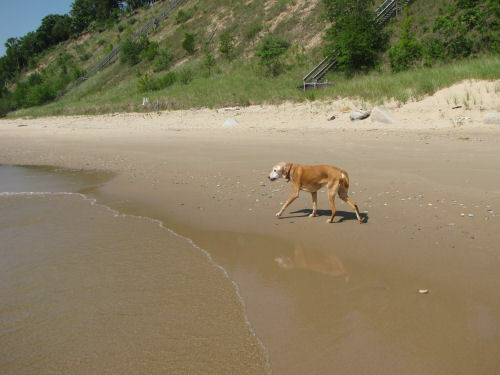 She managed to avoid all the water dog genes from either the Vizsla or Labrador heritage. 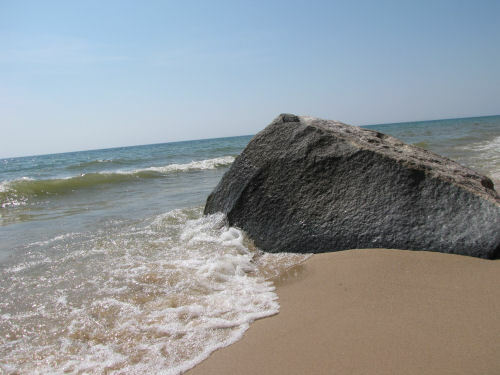 There aren't many big rocks along the Michigan shore, unlike Lake Superior where there are lots of rocks. 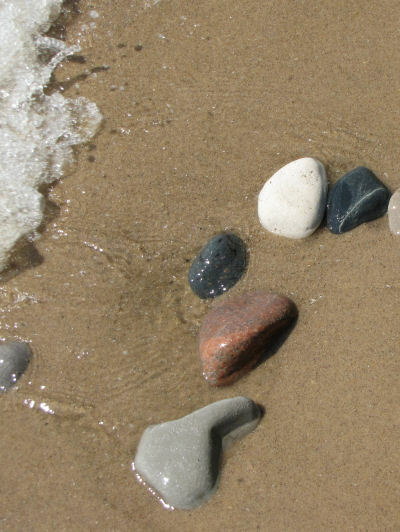 So I was delighted to find that this stretch of beach has quite a few rocks. This was the biggest. The variety of colors and patterns in the rocks was great! 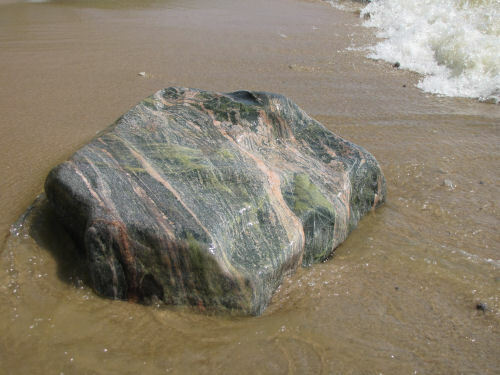 This rock is about three feet across. The commonest colors were pink, white and black, but once in a while there was a bright gem. These are smaller- just a few inches across. I took way too many pictures. I know I've posted more than I usually do, but the beauty of the wet rocks was overwhelming. Just one more... These little beauties were arranged by Mother Nature, just for you. Did you miss me? We had non-stop thunderstorms last night and I couldn't chance connecting to the internet. So I'll do two posts tonight because I have things to share. Yesterday, on a round of work assignments, I saw a whole flock of birds picking over windrows of fresh-cut hay. 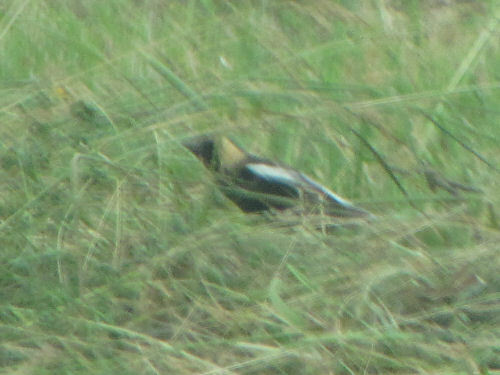 These are terrible pictures, but I'm so excited to be able to prove what I saw. 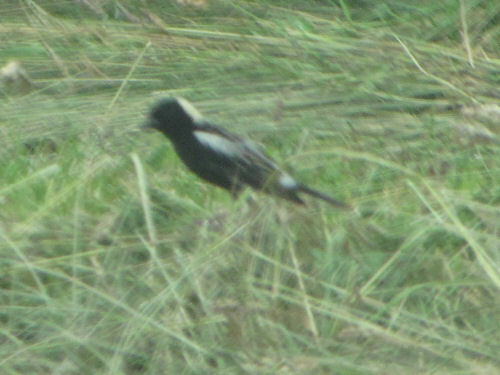 They are Bobolinks! Those first two pictures were taken through the windshield. I was afraid if I got out of the car they'd all fly away. In fact, they did just that. They came back, but not quite so close to the road. The pictures I'm sharing are all males, because they have the white and yellow that shows up so pretty. The females are all black and brown. Not so photogenic. They really like open prairie and hayfields. I think they were probably pulling insects out of the hay. I tried to get a few pictures of them flying, and although they are very far away, these pictures are more clear than the ones through the windshield. Their song is a bubbly twittering, that sort of sounds like "bob-o-link," and they did sing for me! It definitely made my day. The lesson for today is: You have to look at the leaves! There are really quite a few flowers that look just about the same. But the leaves and the stems can sort out most of them. 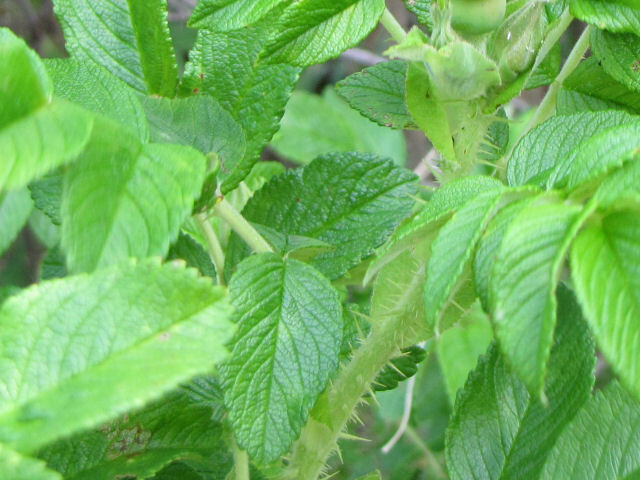 Remember, with the Cat's Ear, the leaves are lobed and hairy. Here's one I really like because the leaves are so interesting. See the lovely purple veins? 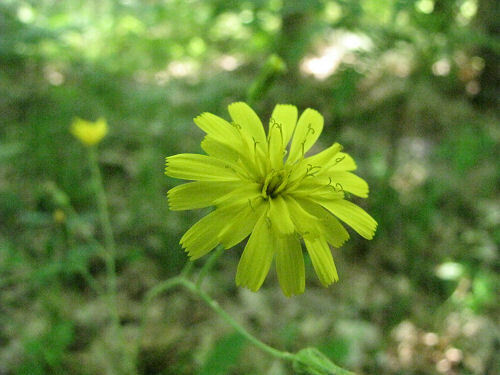 This is called Rattlesnake Weed, Hieracium venosum. Of course, it has nothing to do with rattlesnakes. OK, here's another yellow flower, but this is a completely different plant. 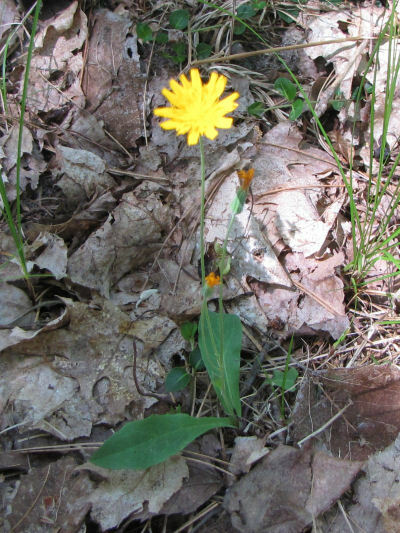 This is actually one of our native dandeliions, Two-flowered Cynthia, Krigia biflora. 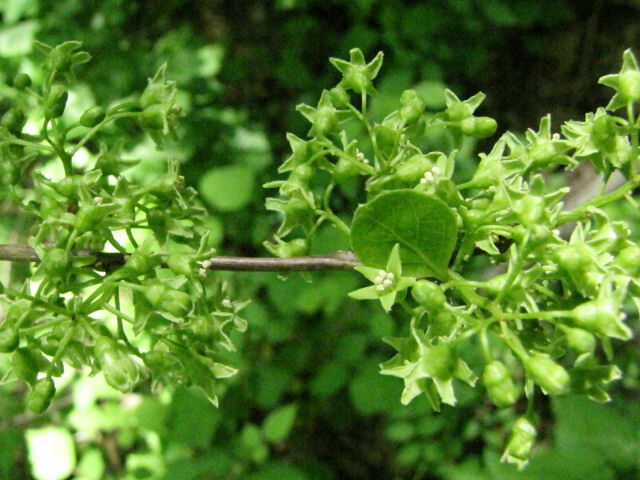 The basal leaves on this one vary, but the flowers are slightly more orangy, and if you look at the stems (there may be more than two), there will be a small leaf at the branching! I'm sure most of you don't care two cents about telling all these thingies apart, but at least you might remember that there are quite a few choices. I just hope I remember!